Dave Gong | The Journal Gazette Fort Wayne Police officers inspect a vehicle that was involved in a shooting, north of South Side High School natatorium Wednesday afternoon. Shortly after 3 p.m. today, a green SUV with shattered windows stopped on the sidewalk north of the South Side High School Natatorium. 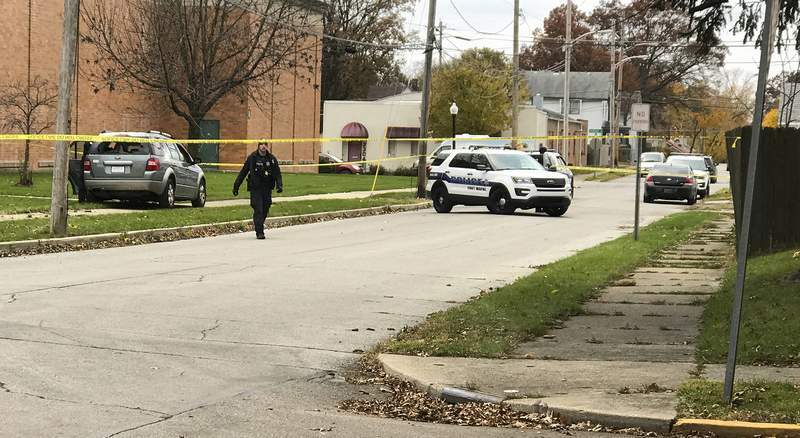 At about 3:05 p.m., city police responded to a reported shooting in the area of Packard Avenue and Clinton Court, spokesman Michael Joyner said. Upon arrival, officers found an SUV had driven off the roadway. Inside, a man was located in the passenger seat suffering from a single gunshot wound to the torso. The man, who has not been identified, was transported to a local hospital where he was listed in serious condition. There were three occupants inside the vehicle, but no one else was injured, Joyner said, noting that it appears to be a targeted incident. "We believe that the shooting took place on the north end of Clinton Court near Piqua (Avenue)," Joyner said. "From limited information we've gotten from witnesses, it appears the party shooting at the victim's car was in a maroon passenger car." Joyner said police have not yet located that car or identified its occupants. It's unknown how many people were in the maroon car at the time of the shooting. The incident remains under investigation by the Fort Wayne Police Department.